Like having the helping hands of your roadies built right into this pair of stands. The TeleLock Series speaker stands from Ultimate Support are extraordinarily strong yet lightweight due to their oversized, heavy-wall aluminum tubing. They're everything you'd expect from an Ultimate Support speaker stand: they're strong, sturdy, lightweight, 100% field serviceable, and easy to set up and take down. Moreover, thanks to auto-locking technology that securely grips the telescoping tube in place as you set its height, the TeleLock collar gives the user the ability to safely raise or lower the speaker stand while a speaker is on it. The Ultimate Support TS-90 is one of the easiest speaker stands to use thanks to its patented TeleLock collar. Set the TeleLock collar to either the "raise" or "lower" setting and the auto-locking technology provides just the right amount of resistance to allow you to raise or lower the speaker while locking the tube in place. The TS-90 speaker stand's offset, tripod base design provides more support than typical "off-the-shelf" speaker stands. The design makes for very tight internal fittings, doing away with unnecessary sloppy leg problems, and includes a super-strong, die-cast metal collar that prevents over tightening and breakage issues often associated with plastic designs. 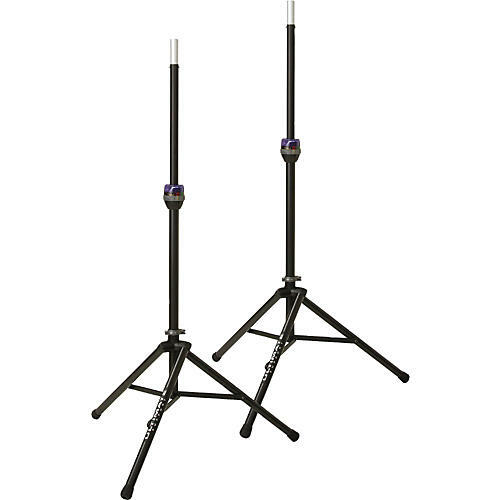 The entire speaker stand (legs, mast, and telescoping tube) uses oversized, heavy-walled aluminum tubing for durability, functionality, and weight savings. The Ultimate Support TS-90 will not rust or corrode (thanks to its architectural, anodized finish), is very smooth to operate, and is extraordinarily strong yet lightweight. From the foot caps on the bottom of the tripod legs all the way up to the speaker adapter at the top of the stand, the TS-90 speaker stand is field-serviceable as needed by the part over its very long lifespan. In the unlikely event that something does break on the speaker stand, instead of throwing the entire stand away and buying a whole new one, simply replace the broken part with the appropriate, affordable part to retain the value of your Ultimate Support TS-90.